In the Columbia area there are many wonderful events perfect for the entire family such as Night at the Museum at the South Carolina State Museum and The Wonderful Wizard of Oz at the Columbia Marionette Theater. For the adults, enjoy various wines, beers, art classes and more at Vista Nights offered by the Congaree Visit Guild in the Vista area of downtown Columbia. January 11 – Katrina’s Kids First Annual Music Benefit at the Music Farm. This benefit is to raise money for kids in foster homes and groups homes with the event including music by “The Blue Pickups”, “James Smith”, “The Hobart Trotter Project” and “Saluda Shoals”. For more information visit http://www.musicfarm.com/event/1408470-katrinas-kids-first-annual-columbia/. January 11 – “Our Little Sister” at the Nickelodeon Theater. Three sisters in their twenties living in a big house in Kamakura meet their younger half-sister when their father dies, who then comes to live with them and they build a very special bond. For more information call (803) 254-8234 or visit http://nickelodeon.org/films/our-little-sister/. January 11 – 12 – “Marvin Hunter” at the Comedy House. You are certain to be entertained by this amazing comedian! For more information call (803) 798-9898 or visit http://comedyhouse.us/marvin-hunter/. January 12 – “ZOSO – The Ultimate Led Zeppelin Experience” at the Music Farm. Their back and again they’ll provide you with an experience that will make you feel like you are truly at a real Led Zeppelin concert. For more information visit http://www.musicfarm.com/event/1295727-zoso-ultimate-led-zeppelin-columbia/. January 12 – Southeast Park Wildlife Walk at Southeast Park on Hazelwood Drive. This Ranger led hike will tour the 64 acres in search of the variety of wildlife that make this park their home. For more information call (803) 545-3100 or visit http://www.columbiasc.gov/parks-recreation/programs-activities/outdoor. January 12 – 14 – “Mulan Jr.” at the Harbison Theater. This Disney musical, produced by the Irmo-Chapin Recreation Commission, will prove to be very fun and entertaining! For more information call (803) 345-6181 or visit http://www.harbisontheatre.org/tickets-productions/mulan-jr.
January 13 – Visualize a Character: Educator Workshop at the Columbia Museum of Art. Using the museums art collection and exhibits, they will introduce new ways of thinking about the curriculum and showing innovative teaching approaches. For more information call (803) 799-2810 or visit https://www.columbiamuseum.org/happenings/visualizing-character%C2%A0-educator-workshop. January 13 – 14 – Night at the Museum at the South Carolina State Museum. Spend a night at the museum, getting the chance to see the new Savage Ancient Seas exhibit, sleep among the exhibits and artifacts, exploring constellations, plants, the moon, and more through the planetarium SkyTour, and observing the sky through the 1926 Alvin Clark telescope. For more information call (803) 898-4921 or visit http://scmuseum.org/events/night-sc-state-museum/. January 13 – 15 – “Kountry Wayne” at the Comedy House. After seeing this young rising star in person, he will certainly have you searching him out in the future! For more information call (803) 798-9898 or visit http://comedyhouse.us/kountry-wayne/. January 13 – 15 & 18 – 22 – “Sylvia” at the Workshop Theatre. This story about a married couple and the dog her husband brings home that puts their marriage in jeopardy, is a touching comedy of how Sylvia becomes an important part of their lives. For more information call (803) 799-4876 or visit https://www.workshoptheatre.com/shows.html#season. January 13 – 16 – SCARAB 2017 at the Medallion Conference Center on Garners Ferry Road. Come out for South Carolinas premier gaming convention! For more information visit http://www.s-c-a-r-a-b.com/. January 13 – 21 – “Boy” at the Trustus Theatre. Based on a true story, you will learn the story of Adam Turner, a man who is forced to deal with the gender cards he’s given, and nor the ones he was born with because of a botched circumcision and the doctors recommendations that he live as a female. For more information call (803) 254-9732 ext. 1 or visit https://trustus.org/event/boy/. January 14 – Rainbarrel Workshop at Riverfront Park meeting at the Red Schoolhouse in the Riverfront Park South parking lot on Laurel Street. Prepare for that spring and summer garden by attending this workshop on how to put together a rain barrel, with residents of the City of Columbia being entitle to receive one free for attending the workshop, with other area residents having the chance to purchase one at a discounted rate. For more information call (803) 545-3100 or visit http://www.columbiasc.gov/parks-recreation/programs-activities/outdoor. January 14 – “Mook: Red Roses Concert” at the Music Farm. For more information visit http://www.musicfarm.com/event/1380333-mook-red-roses-concert-columbia/. 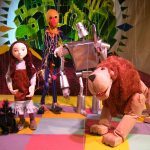 January 14 – February 11 – “The Wonderful Wizard of Oz” at the Columbia Marionette Theater. Children and their adults alike will enjoy this wonderful tale! For more information call (803) 252-7366 or visit http://cmtpuppet.org/shows/the-wonderful-wizard-of-oz/. January 15 – MLK Gospel Festival at the Koger Center for the Arts. Celebrate this special day with some wonderful Gospel music by The Williams Brothers Roy Revelation. For more information call (803) 777-7500 or visit http://www.kogercenterforthearts.com/event.php?id=305. January 15 – ‘PSALM ZERO” and “Baggage Claim” at the Infinity Room at the Tapps Art Center. The former band from New York is a blend of industrial metal and dark pop, with the latter band being an “experimental electronic project” of Columbia artist Adam Drawdy. For more information call (803) 988-0013 or visit http://www.tappsartscenter.com/event/infinite-room-psalm-zero-baggage-klaim/. January 15 – “An Evening with Jaheim” at the Township Auditorium. Enjoy an evening of great music with this famous R&B singer. For more information call (803) 576-2350 or visit http://www.thetownship.org/events/. January 16 – Dr. Martin Luther King, Jr. Celebration at the Martin Luther King, Jr. Park. This event will also include a wreath laying ceremony at the historical marker at Harden and Greene Street honoring this great figure. For more information call (803) 545-3100 or visit https://www.columbiasc.gov/calendar/2239. January 17 – Winter is for the Birds at Riverfront Park, meeting at the Canal Head gates at the Riverfront Park North parking lot on Rivers Drive. Begin this event by learning about the birds in the area and those in your yard, and by ending the event making a pinecone and seed feeders for you to take home. For more information call (803) 545-3100 or visit http://www.columbiasc.gov/parks-recreation/programs-activities/outdoor. January 17 – “USC Symphony Orchestra: Maestro Portnoy and Friends” at the Koger Center for the Arts. For more information call (803) 777-7500 or visit http://www.kogercenterforthearts.com/event.php?id=247. January 17 – 22 – Harbison Overnight Mountain Biking Trip at Harbison State Forest. If you are a mountain bike enthusiast, you won’t want to miss this opportunity to bike the trails of this wonderful park while enjoying the chance to camp as well. For more information visit http://www.active.com/charleston-sc/cycling/mountain-biking-classes/harbison-overnight-bike-trip-2017-a. January 19 – “MYX Kaplan” at the Tapps Art Center. This is the 2nd anniversary show with this starting headliner who has been seen on numerous television talk shows, Comedy Central, and was most recently on America’s Got Talent and is set to keep you laughing until it hurts!! For more information call (803) 988-0013 or visit http://www.tappsartscenter.com/event/third-thursday-comedy-presents-myq-kaplan/. January 20 – “Wiesenthal” at the Harbison Theater. Get the chance to set into the world of the most respected Nazi hunter as he shares the story of his life’s work. For more information call (803) 407-5011 or visit http://www.harbisontheatre.org/tickets-productions/wiesenthal-0. January 20 – “Lee Brice and Justin Moore: American Made Tour” at the Colonial Life Arena. Come out for a night of great country music with these two amazing artists! For more information call (803) 576-9200 or visit https://www.coloniallifearena.com/lee-brice-justin-moore.php?eventid=125. January 20 – CMA Jazz on Main: “Gypsy Jazz with Andy Page and Matt Williams” at the Columbia Museum of Art. Enjoy an evening starting with happy hour, tours of the galleries, and ending the night with wonderful entertainment. For more information call (803) 799-2810 or visit https://www.columbiamuseum.org/happenings/cma-jazz-main-4. January 20 – February 5 – “You Can’t Take It With You” at the Town Theater. Meet a batty New York City family whose daughter is engaged to the son of the boss of a Wall Street firm who brings his parents over to meet his fiancé’s but shows up a day early. For more information call (803) 799-2510 or visit http://towntheatre.com/you-cant-take-it-with-you/. January 21 – Embroidary 101 at the Columbia Museum of Art. Come out and learn the art of basic needlework in this beginning workshop. For more information call (803) 799-2810 or visit https://www.columbiamuseum.org/happenings/embroidery-101. January 21 – Mixed Media Jewelry Workshop at the Art Center on Calhoun Street. Learn to make jewelry using a variety of materials to include polymer clay, stem punk, traditional beading. For more information call (803) 545-3093 or visit https://www.columbiasc.gov/depts/parks-recreation/january_2017_workshops.pdf. January 21 – Red Shoe Run at Hand Middle School. Come out and support this wonderful organization that provides housing for families with critically ill children in the hospital. For more information send an email to Jessica@rmhcofcolumbia.org or visit http://rmhcofcolumbia.org/RedShoeRun. January 21 – Columbia Canal History meeting at the Red Schoolhouse at Riverfront Park South Parking Lot. This ranger led walk will teach you the history of the canal and its importance in the growth of Columbia while learning about the original canal, Columbia’s waterworks, the earliest hydropower plants, and the S.C. State Penitentiary. For more information call (803) 545-3100 or visit https://www.columbiasc.gov/calendar/2283. January 21 – “LifeChance” at the Koger Center for the Arts. Presented by the Columbia Classical Ballet, you’ll enjoy the International Ballet Gala of Stars. For more information call (803) 777-7500 or visit http://www.kogercenterforthearts.com/event.php?id=280. January 21 – ContraCola at the Emerald Ballroom. Bring a covered dish for a potluck feast and enjoy an evening of contra dancing, with beginners basics after the potluck for those who are new. For more information visit http://www.contracola.org/. January 21 – Kings and Queens of Hip Hop at the Township Auditorium. You’ll have the chance to see DMX, JA Rule, Juvenile, Yinig Yang Twins, Michel’le, Khia, and more. For more information call (803) 576-2350 or visit http://www.thetownship.org/events/. January 21 – Haynes Bluegrass: “Wayne Taylor and Friend” at the Haynes Auditorium in Gilbert. Included in this event will be opening act “Flatland Express.” For more information call (803) 582-8479 or visit http://www.haynesbluegrass.com/. January 21 – 22 – Winter Stamp and Postcard Show at Spring Valley High School. This event will showcase 13 stamp and postcard dealers and other postal historical exhibits, with dealers available to evaluate your collection and provide you with an estimate. For more information visit https://www.facebook.com/groups/ColumbiaPhilatelicSociety/. January 21 – 22 – Gun and Knife Show at the Jamil Temple. Come out and take a look at what the vendors have to offer and you just might find that item you’ve been looking for. For more information visit http://www.jamilshriners.com/news/calendar.html. January 22 – “Wild Kratts Live” at the Koger Center for the Arts. The animated Kratt brothers, Martin and Chris, “come to real life” for kids of all ages. For more information call (803) 777-7500 or visit http://www.kogercenterforthearts.com/event.php?id=202. January 24 – “Les Liaisons Dangereuses” at the Harbison Theater. Presented live from the National Theater in London, you’ll experience a number of aristocrats and their ploys to get revenge through seduction and as they toy with others hearts and reputations, their own may prove more fragile than they believe. For more information call (803) 407-5011 or visit http://www.harbisontheatre.org/tickets-productions/les-liaisons-dangereuses. January 24 – Ann Arbor Film Festival Digital Tour at the Nickelodeon Theater. You’ll have the chance to see independent and experiential short films across all genres: experimental, documentary, animation, narrative, and hybrids. For more information call (803) 254-8234 or visit http://nickelodeon.org/films/ann-arbor-film-festival-program/. January 26 – 29 – “Ringling Bros. and Barnum & Bailey Presents Out of this World” at the Colonial Life Arena. This storyline will intrigue the entire family with space age fun and technology in an amazing new show you won’t want to miss! 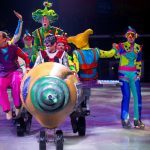 For more information call (803) 579-9200 or visit https://www.coloniallifearena.com/ringling-bros-and-barnum-bailey-presents-out-of-this-world.php?eventid=105.